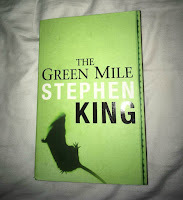 The first book I finished reading this month was Stephen King's 'The Green Mile'. This is the first Stephen King book that I've read and I have to say that I thought it was brilliant. Although I have obviously heard of the book and the film, I have never seen it and I didn't even know the storyline. All I knew was that it included someone with some sort of healing powers in a prison and that he was sentenced to death... that's it. So I was glad that I was able to read such a well known book and still be surpised with the story. The story itself was really interesting, I didn't expect what I read. I only know Stephen King for his straight up horrors and I didn't think his stories would cover such emotions as this. I thought that the story was intriguing and created a good mystery, once the case was unraveling. There are lots of points in the story that really make you angry, I'm easily pursuaded and there are people in it that really make you squirm! There were quite a few sections that really made me sad and there are definitely others that fill you with hope! This makes me sound like I'm trying to sell the book... I'm really not, I just felt this way after reading it (I know, I get waaay into books...). The story goes through many different phases and focuses on different peoples' cases, even though it all leads up to the main event, which I really liked as it gets you more involved in the story and the environment it takes place in. Overall I will say that this is an enjoyable book to read, even if it is quite depressing. I finished this book in 2 weeks, and for me, that's incredibly quick for its size! I didn't get bored of it and I enjoyed reading most parts. I found myself wanting to find out what happens, as opposed to just wanting to finish it. Iwould definitely recommend The Green Mile and I also think I will try a few other Stephen King books in the future, as I like the style this was written in. 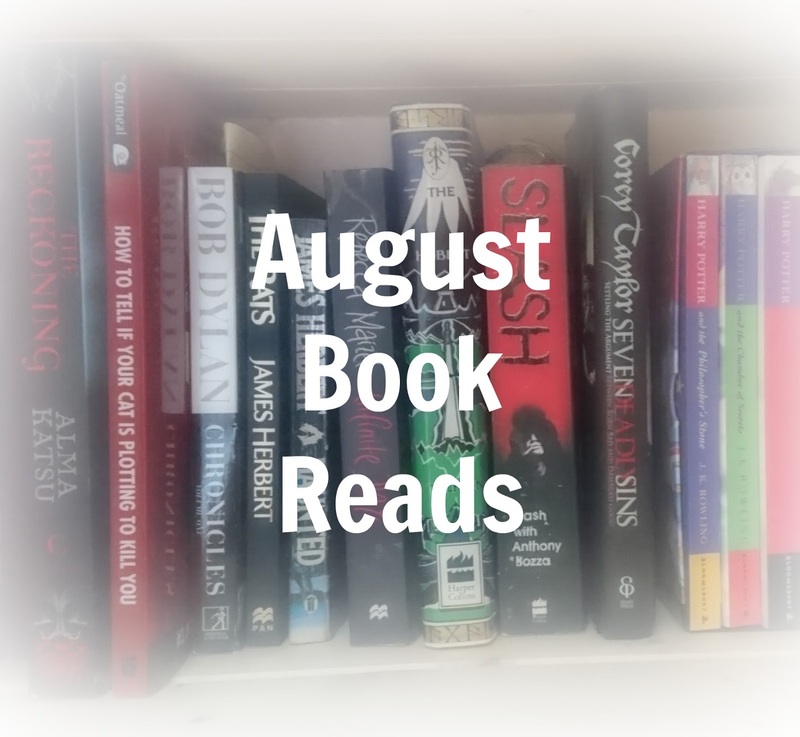 My next August book is Corey Taylor's 'Seven Deadly Sins'. I've had this book for literally YEARS now and have tried to start it a few times, but I always found it slightly too bulked out with words. That may make me seem simple, but I feel that some words and sentences just seemed to add bulk to the start of the book, instead of adding to the story/purpose of the book. I finally started it for third time this month and finally managed to finish it and, you know what, I actually really enjoyed it! I'm writting a review to post on here about the book itself, as I realised that my thoughts on it were WAY to much to write in a round-up post! But in short, I believe it was a great book that made me think about how I feel and really opened my eyes to how I should feel about other people. It's an honest book that doesn't hold back and contains some shocking things, as well as being humorous. The review should be up next Friday, so if you're interested then keep your eyes peeled for that! All in all, if you're a fan of Corey, or need some help and definition on your feelings or how you think of yourself, then I would really give this book a go! So I know I'm a little late on these books, but I've finally started reading the Harry Potter series! This month I finished the first 2 and in all honesty, I could not put them down. I finished them in 4 days, which - as said about The Green Mile - is incredibly quick for me. Reading them brought back great feelings, as I haven't seen the first few films in quite a few years! The first book seems quite closely linked to the film but I think they start broadening and separating throughout the next few books. It was great reading them as it made me think about parts in the films that I'd forgotten and brought the story back to me. They're very descriptive, which is great for the imagination and I even came up with some of my own images of characters in my head, instead of seeing the actors! They're incredibly fun and are easy to read, which was nice when I didn't feel like thinking too much. Comparing the books to the films you can see where seemingly important quotes have been taken and put into the film, which gives even more connection between them. As said, they are quite similar but the second book varies more from the film, like when McGonagall tells the students about the Chamber of Secrets, unlike Professor Binns in the book. I'm definitely going to carry on reading these, I'm enjoying them so much! I think I'm going to break it up however as I am currently now reading Red Dragon by Thomas Harris, I might start reading them after that, I may not.... WHO KNOWS! 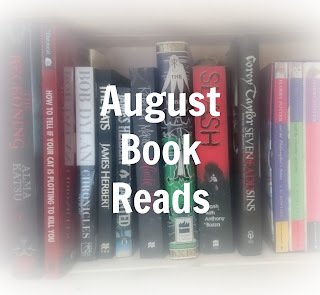 Anyway, however long it takes I plan to read them, and I have a big list of books to read for the upcoming months, so expect more of these in the future!